30 year 6 children took part in a Football Tournament at Conyers Secondary School on Wednesday 5th December. 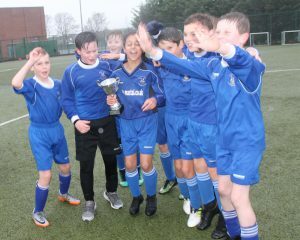 The children were organised into 3 teams, IMPS United, IMPS Rangers and IMPS Town; all were competently led by their captains, Kulreet S, Ali A and Libbie W. All teams played brilliantly despite the persistent rain and penetrating cold. IMPS United went on to be overall winners, retaining the Trophy for the second year running. A notable performance came from Lucas Waters; usually a goalie, he was needed to play outfield as one of his teammates was injured. He went on to score a hat-trick! IMPS United will go on to play in the Stockton Finals in February. We had 4 finalists who made it to the Cross Country Finals at Stewart’s Park. They ran brilliantly. Well done to Casey Boland, Katie Hutchinson, Mathew Simpson and Brooke parker. Thank you to parents for your support with this event. Lewis Mosley was asked to represent the Stockton Schools at the Tees Valley Swimming Championships held at the Dolphin centre on the 5th April. Well done Lewis for an amazing achievement. Thanks you to parents for your support with this event. On Thursday 16th March we had 10 Year 5 & 6 swimmers who made it to the Stockton Schools’ Swimming Finals which were held at Billingham Forum. All the competitors swam really well and we won 2 individual silver medals and 1 individual bronze medal. Behaviour on poolside and the childrens’ sporting attitudes were exemplary as always. Well done everyone. Thank you to the parents and families who came to support the children. On February 24th 30 Year 3 and 4 children attended the Hoopstartz Festival in Billingham. The children tried, and enjoyed, many new active skills and had loads of fun! 16 children from Year 5 & 6 attended the Stockton Schools’ Swimming Gala. All swam really well and 10 children qualified for the finals to be held on March 16th. We wish them well on the day. 15 children from Years 3 – 6 attended the cross country trials at Preston Park on Wednesday 1st February. All the children ran really well in the muddy conditions and 4 children have made it to the finals to be held at Stewart’s Park on March the 29th. Well done to Casey, Brooke, Rosie and Matthew and all who took part. Our cross country teams attended the festival at Conyers on Wednesday 12th January. It was a cold and windy day but our 35 runners performed brilliantly and had a great afternoon. Well done everybody. 30 children went to Conyers to participate in the athletics festival on Wednesday 30th November. Everyone had a great time and joined in with enthusiasm for a range of events. Well done to all who took part. 30 children from Year 2 attended the Key Stage One PE Festival on Friday the 25th November in Billingham. Everyone had a fantastic time trying out several PE activities. Lots of fun, exercise and laughter all round! Well done to everyone who took part in such a sporting manner. All of the Reception children attended the Early Years PE Festival on Monday 28th November. After a fun warm up with Sporty Bear the children tried 8 different activities including a game of Sharks – luckily all managed to escape from the shark and return to school by hometime. There were many smiles and some tired children on the bus home. Well done to all who took part. The reception children had a fantastic, fun afternoon on the 9th November at the Early Years Sports festival. 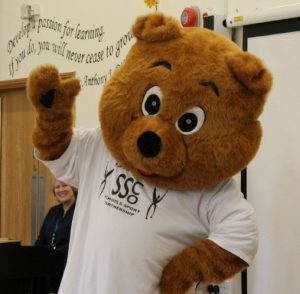 They warmed up with children from 5 other schools led by Sporty Bear to begin the activities. 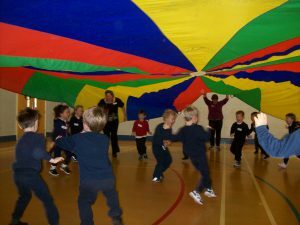 They took part in 7 different workshops including using the parachute, floaty scarves and bumpy balls. Thank you to all who helped on our first exciting trip from Reception. Sporty Bear asked us to enter a competition to design a healthy lunch to go in his packed lunch box. Years 1—3 have entered this with some great ideas. We look forward to hearing the results at the end of the year. Good Luck to all who entered. 3 Tag Rugby teams attended their festival on 7th October, they had a great afternoon despite the rain and played really well. Well done to the Y6 Football Team who made it to the Stockton Finals. They played really well and finished 3rd overall. 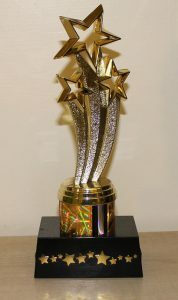 During the year all classes will compete within their year group to win this trophy. Year 5 are currently applying to join the Sports Crew which runs sports activities during lunchtimes with the Year 3 and 4 children. Congratulations to our fantastic swimmers who did us proud at the Stockton Schools’ Finals Gala at Billingham Forum on 17th March. Well done everybody. Nathan has been selected for the Tees Valley Finals. Good luck Nathan.